You've been checking the news daily and reading this year's farmers almanac, but you're still not sure when to expect the first snowfall of the year. We love winter more than most, but we also know that no one wants to wake up one morning greeted by a foot of unexpected snow. Even though snowfall in your area may be inevitable, preparing early ensures you won't be snowed in and unprepared when you least expect it. Just make sure you have a snowblower that fulfills the demands of your driveway. 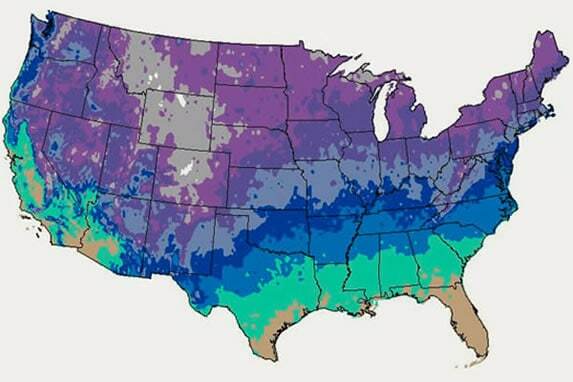 To estimate the first snowfall in your area, check out the map below provided by the National Oceanic & Atmospheric Administration (NOAA). When Does It Start Snowing Near Me? Although the first snowfall varies across the USA every year, historically it will snow first at high-altitudes like the Rocky Mountains before Chicago and the Midwest. Snowfall will eventually make its way south later in the year as the season moves into full swing. Use the map and key above to determine when you can generally expect the first snowfall near you. How Do I prepare for the Winter Season? Nothing is worse than pulling out your snowblower for the first time during a blizzard just to find it won't start. If you're a planner, the first step is to make sure that you've completed proper pre-season maintenance on your snowblower. Typical maintenance includes checking or replacing your spark plug and making sure you have the proper oil, gas, and a gas can to mix your fuel properly. Also, it helps to start your blower once before the snow season to detect any problems before you get buried in the garage. Even if you don't have a snowblower, you can clear snow even faster by attaching a snow plow or blower directly to your tractor. Sometimes this alternative is better when garage space is limited or you enjoy the convenience of clearing snow while sitting down. As much as we love the snow, we take safety and preparation seriously. Making sure your family, car, and house are all prepared for winter will keep everyone safe. There are plenty of checklists out there; just don't let winter catch you off-guard. After all, you won't be clearing snow in a blizzard during a winter emergency. Even though you stored and maintained your snowblower properly at the end of last season, sometimes it may still be difficult to start after a while. We have some simple steps to make sure your snowblower will start the first time you pull it out of your garage. When it's finally time to clear the snow, we recommend wearing layers and proper winter gear to keep you warm, dry, and happy. Now that you've prepared for winter, there's nothing left but to go forth and conquer your driveway. Just be sure that you're using your snowblower safely, and you'll be happily clearing your driveway in minutes. First Snowfall of the Year - View Our When Does It Start Snowing Near Me. Our snowblower how-to library can help you pick the perfect single-stage snowblower, two-stage snowblower or snow blower accessory.